A rare and important Post-Revolutionary War Era map of New England. One of the first maps to recognize Vermont as a state. Bowles's New One-Sheet Map of New England; comprehending the Provinces of Massachusets Bay And New Hampshire; with the Colonies of Connecticut & Rhode Island; Divided into their Counties, Townships &c. Together with an Accurate Plan of the Town, Harbour and Environs of Boston. A rare separately published c. 1796 map of New England by Bowles and Carver. Centered on Massachusetts, this map covers the New England coastline from Long Island, New York, to Little Kennebec Bay, Maine, and from Cape Cod and Nantucket westward to just beyond the Hudson River. This map was initially issued by Carrington Bowles in 1765 as a reduced and updated improvement upon the 1755 John Green / Braddock Mead map of the same region. The map transitioned through six known states, the present example representing the last and final iteration offering a number of cartographic firsts and significant important updates. Bowles and Carver's map contains a wealth of updates, particularly in the northern quadrants, and can thus be considered only loosely connected to its 1755 parent map. Although it is unclear what Bowles's sources for these updates were, they are many and significant, including new roads, advanced geographical information, updated towns and counties, and revised border configurations. Perhaps the most significant of these is the presentation of Vermont as a state - making this one of earliest maps to do so. Vermont was incorporated as a state in 1791, so this map is an exceptionally early documentation of it thus, evident in only the last two states of the map. Vermont's 'state' status is clearly supported in an annotation along the northern border of the map which starts with 'This State…' Bowles further more expands the Vermont border westward at the expense of New York as far as the Hudson River. Similarly New Hampshire is significantly updated with New Towns, roads, and a more sophisticated presentation of the state's several great lakes. In New York, just north of Albany, there is a note identifying the Seat of Sir William Johnson, an Anglo-Irish Baronet who moved to New York to manage an estate in the midst of Mohawk territories. Johnson mastered the Mohawk language as well as Iroquois customs and served as a liaison between the British Crown and the American Indian nations. Johnson died shortly before the outbreak of the American Revolutionary War. Additional fortifications and settlements are noted all along the Hudson River. 2nd state: Carrington Bowles imprint-1st Jany. 1771. 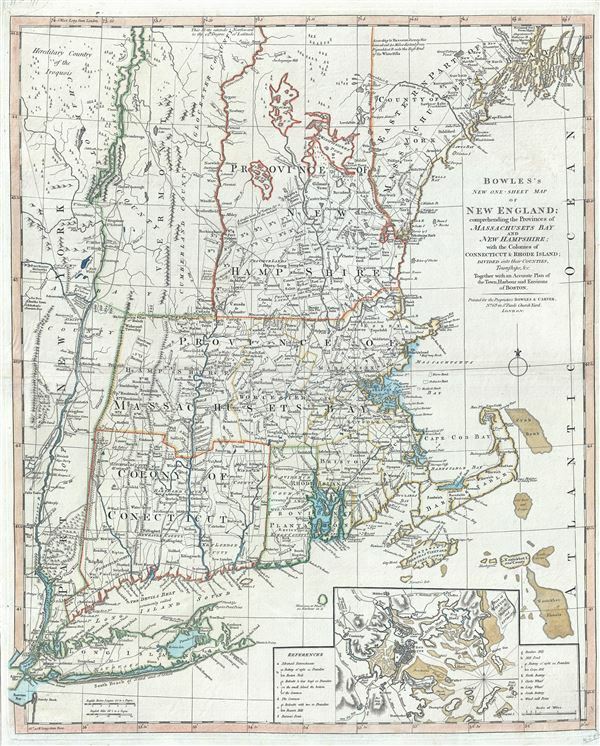 3rd state: New Title: Bowles's Map of the Seat of War in New England; Boston & Environs inset added. 4th state: New Title: Bowles's New Pocket Map of the Most Inhabited Part of New England. The Bowles family ( fl. c. 1714 - 1832 ) were publishers and map sellers active in London from c. 1714 to c. 1832. The firm, under Thomas Bowles ( fl. 1714 - 1763), John Bowles (1701-1779), Carrington Bowles (1724 - 1793), and as Bowles and Carver (fl. 1794 - 1832), produced a massive corpus of work that included numerous atlases, pocket maps , and wall maps. The Bowles publishing tradition was kept alive over four generations starting with Thomas Bowles who was a print engraver in the late 17th century. The first maps issued by the firm were actually produced by his son, Thomas Bowles the second, who based in self in St. Paul's Churchyard, London. Thomas's brother, John Bowles (called "Old John Bowles" or "Black Horse Bowles" by those who knew his shop), was also an active publisher and was established at no. 13 Cornhill. It is said that he was one of the first publishers of William Hogarth's works. It was here that John's son, Carrington Bowles, was introduced to the trade. Carrington took over the Cornhill bookshop and eventually merged it with his uncles shop in St. Paul's Churchyard. On Carrington's death in 1793, the business was passed to his son Henry Carrington Bowles, who partnered with Samuel Carver, renaming the firm, Bowles and Carver. Under this imprint the firm continued to publish maps and atlases until the early 1830s. Tooley, R. V., The Mapping of America, (Stevens and Tree), 32f. McCorkle, B. B, New England in Early Printed Maps 1513 - 1800, #765.1. Library of Congress, G3720 178- .B6. Fite, Emerson David and Freeman, Archibald (eds. ), A Book of Old Maps, Delineating American History from the Earliest Days down to the Close of the Revolutionary War, #60. Baynton-Williams, Ashley, Printed Maps of New England to 1780, (www.MapForum.com, issue no. 15), item #1765:01f. Cobb, 'Vermont Maps Prior to 1900,' Vermont History, vol. XXXIX no. 3-4 (1971), item #45.